So I blogged about the herbs I am taking for premenopause, in the last blog A Month of Health II I blogged about the herbs I am taking for health geared toward my blood type. There are more, but what I want to talk about in this post, part of the A Month of Health series, is what the man at the health store said to me that made me go WHAT??????? The man at the health store had the nerve to tell me I am not exercising enough. You're kidding right? I exercise at least three times a week sometimes more. No, he said you are not getting the right kind of exercise. But, I do cardo and toning each time I exercise I don't understand. At this point he told me I needed a rebounder, which just one of those in house trampolines. Oh, soooo what is the difference? Turns out that rebounding helps to release lymph which is toxins and waste that become trapped in our lymph nodes. 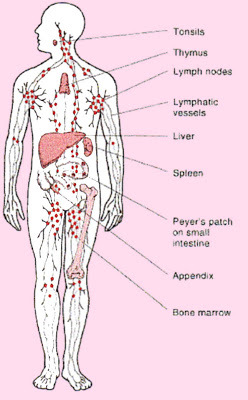 Toxins and other waste which are to big to go through the blood stream go into the lymph nodes and our nodes can become blocked. Well I had to learn more about this topic. I no longer take someone's word about anything pertaining to my health I have to find out for my self. Plus I also get a better understanding of my body and how it works. So, I came home and did some research on the topic what I found out is very interesting. I added a rebounder to my collection of work out toys.